In my research, I reviewed the differences and similarities in hundreds of psychotherapeutic approaches, and I found that there is no real 'therapy', but a special situation in which the 'therapist' creates for the 'client' a temporary sense of a safe place. Only thanks to this sense of safety the client can identify and listen to his own feelings and sometimes even change them. By practicing our emotional skills, we also create our personal narrative, which is our life story and our unique character and personality. As long as we practice our emotional skills, we can regain control on our life story and better navigate in the world. The method of Emotional Training is based on seven emotional skills, which are essential for survival. Emotional Training is not 'therapy' or a manual for solving crises, but a practical method that prevents crises and enables us to realize our personal potential. Emotional Training is an efficient way to improve interpersonal relationships, parenthood, duality, and to cope with trauma and changes and to improve our personal capacities. Practicing the emotional skills is not external 'therapy' but a daily practice. I can help you do that through the Internet, in the online clinic, and also in seven-day seminars in our beautiful village in Bulgaria (for couples, parents, PTSD victims, directors, etc.). You can also meet me and explore Emotional Training in the open forum on this site. For details, please write to me: drorgreen@gmail.com.In my research, I reviewed the differences and similarities in hundreds of psychotherapeutic approaches, and I found that there is no real 'therapy', but a special situation in which the 'therapist' creates for the 'client' a temporary sense of a safe place. Only thanks to this sense of safety the client can identify and listen to his own feelings and sometimes even change them. Read more about the emotional skills. Thus, I found that the sense of a safe place that help us cope with our natural death anxiety is the efficient practice of our emotional skills. Instead of 'healing' or manipulating my clients, I taught them how to identify their emotional skills and improve them by themselves, by regular practice, without being dependent on therapists or counselors. 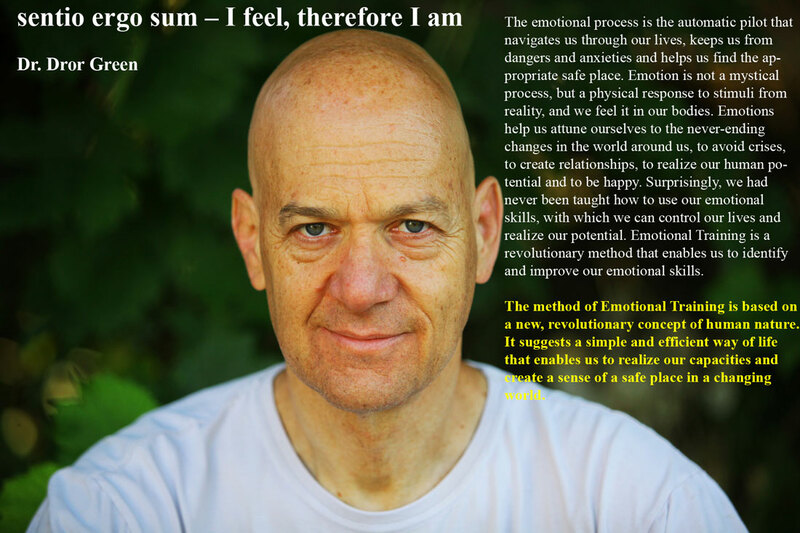 The emotional skills enable us to attune ourselves to reality and create a sense of a safe place. The emotional process is not a mystical concept, as is customary to believe, but an automatic pilot that navigates us in our lives, enables us to cope with death anxiety and create a sense of a safe place in each moment of our lives. It is a closed system that enables us to survive. If we don't attune it continuously to changes in reality, it will fail us and create predictable crises. All theories of crises are explained by our avoidance of changing and improving our emotional process. Read more about the emotional process. According to the method of Emotional Training we are motivated by the need to reduce our natural death anxiety as much as possible, and to create a sense of a safe place. This is the role of the emotional process. 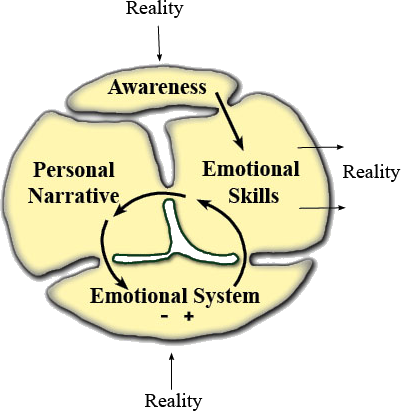 The method of Emotional Training is based on a new revolutionary concept of human nature. This concept doesn't distinguish between body and 'mind', and defines emotions as physical responses to stimuli from reality. Such a concept is resonated with new researches in neuroscience and with the understanding that empathy is inborn. Read more about the new concept of human nature. Emotional Training is based on the assumption that we can be responsible for our actions, our bodies, our health and our feelings and that we don't have to be dependent on others or to face foreseen crises.